Torba А. V.Osmyatchenko V. O.
Annotation. 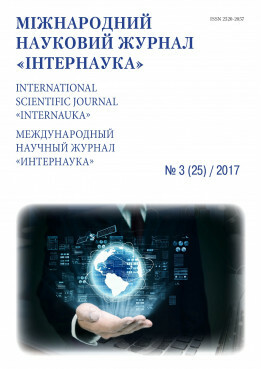 The article is devoted to research of innovations as a component of intellectual capital and coverage of the current state of innovation activity in Ukraine, introduction of innovations into the sphere of energy saving. The article considers different approaches to the interpretation of the concept of "innovations". It defines that most scientists treat the term "innovations" as new products, business processes or organizational changes that form wealth or social well-being. Such a semantic interpretation of "innovations" was also submitted to the Law on Innovative Activity. But innovation should not be considered as an opening, because they can be only part of the entire innovation process, and not just its essence. Based on the analysis of the current state of innovation in Ukraine, it was found that the National Innovation System was unable to stimulate investment processes, and industry demonstrates an extensive development path without changes in basic technologies. The main source of financing for industrial enterprises is their own resources, and their volumes are constantly decreasing. When considering the state of innovation in the introduction of nanotechnology in the energy sector, it was found that Ukraine today belongs to the highest league of world science in the field of innovation, in particular, with regard to the introduction of energy saving technologies, but despite the high scientific potential and many years of experience in creating technologically complex products, The country is gradually losing its position in the markets of high-tech goods and services. The article emphasizes that the experience of world leaders in innovation and high technologies such as Sweden, Switzerland, the United States, the United Kingdom and the Netherlands should be used in Ukraine, which over recent decades has been actively increasing the costs of science, innovation, high technologies, the development of even Does not stop in the period of financial and economic crises. A prerequisite for this is the development of a state strategy that all interested parties of the society will support. Keywords: innovations, innovative activity, intellectual capital, nanotechnologies, information and intellectual resources, energy saving.